There is nothing worse then spending time perfecting your make-up and then for something to ruin it all in a split second. This is where a fixing spray comes in handy. I have been using them for at least 2 years and they do make a difference. 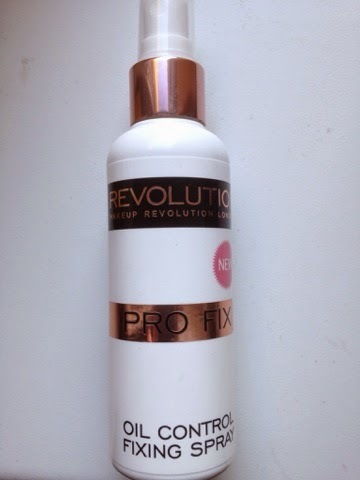 Recently, I was contacted by Make-up Revolution to try out their new Pro Fix Oil Control Fixing Spray. This spray,as the name suggests, is a fixing spray for make-up and it also reduces shine for a matte finish. I must say that this spray is pretty good for the £5 price tag that is attached to it.My make-up can slide off on certain points of my face during the day (mainly oily areas) and then I have to touch-up. However, with this spray it doesn't slide off. It has even passed the 3-gym-class-in-a-row sweat test. Impressive. There is one thing I'm not too sure about and that is the smell. Some of the fixing sprays I have used before have a nice, non-chemical smell to them...this one not so much. Have you tried any fixing sprays before?